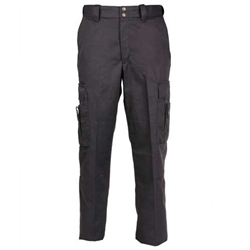 When every second counts, the PROPPER™ CRITICALEDGE™ EMS Pant has everything you count on. Its 65% polyester/ 35% cotton twill fabric is strong, comfortable, and treated with DuPont™ Teflon® fabric protector for liquid and stain resistance. 18 pockets provide secure space for all your critical gear, including dual six-way cargo/scissor pockets at the thigh and besom pockets on the calves. The gusseted crotch and reinforced double knee add durability, and the hidden elastic slider waistband adjusts to your body as you move throughout the day.